Engine Control Enclosure for J1939 electronically governed T4F Engines. 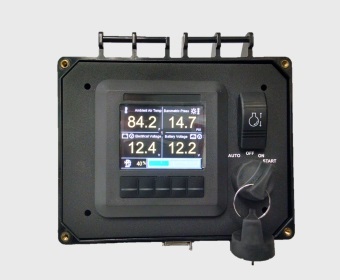 Fully assembled NEMA 4X panel measures 8" x 6" and consists of: 3.5" Color Digital display, sealed ignition switch, throttle switch and engine interconnect. Features include Auto Start, Programmable Engine shutdown, Programmable remote engine speeds (3), 9 programmable maintenance timers and an alarm output. Ideal for use in the Industrial Applications including Pump, Generator and Auxiliary Engine applications. Call our sales department (267-932-8573 x340) or email sales@mbwtech.com to purchase this item. (267-932-8573 x340) or email us. Click here to view and download our user manuals, data sheets, mounting templates and product drawings.